There are plenty of Restaurants in and around Colva that serve a wide variety of food to suit every taste and budget. Standard as well as Budget hotels cater to a wide range of tourists. There are even plenty of high class hotels and good guesthouses.There is a real good traffic of tourists coming in to visit this place. As a result of which plenty of hotels are coming up. Beach Attractions Swimming and Sunbath A beach where the undercurrents are not strong and jelly fishes absent, swimming has gained tremendous popularity. If swimming is popular, how can one leave behind sunbathing. So many tourists, specially the ones from foreign soil, lay down on the sparkling white sand under the Colva sky and just relax . The Colva Nightlife Of all the Goa beaches, the nightlife of Colva is the most livelier. 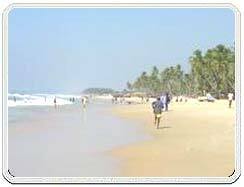 Infact, most young couples opt for Colva package tours. The most happening night spots of Colva remain open till late at night. Eating, drinking and dancing, those who come to the places really party very hard. The Beach Restaurants The gorgeous interiors consisting generally of small tables, matching table-clothes, candles and smooth music, the various Colva restaurants lined all along the beach offer tasty seafood and other delicacies to the tourist. A place with a bustling nightlife, candle light dinners are very popular here. If that isn't interesting, opting for dinner under the moonlight would definitely have a cheering effect. Attractions near the Beach Although not exactly on the beach, yet very near to the beach is Nossa Senhora de Merces (Our Lady of Mercy) Church. This church is famous for Fama of Menino Jesuse-the annual religious festival of the Catholic community. On the occasion, one of Goa's most popular community feasts is held. An annual bullfighting event held in an empty paddy field near to the beach also draws large number of tourists. 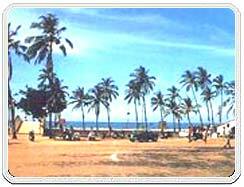 Colva is a beach very popular among young couples. But it should not be mistaken as the exclusive domain of young ones. Vacationing with the family is also very popular here.